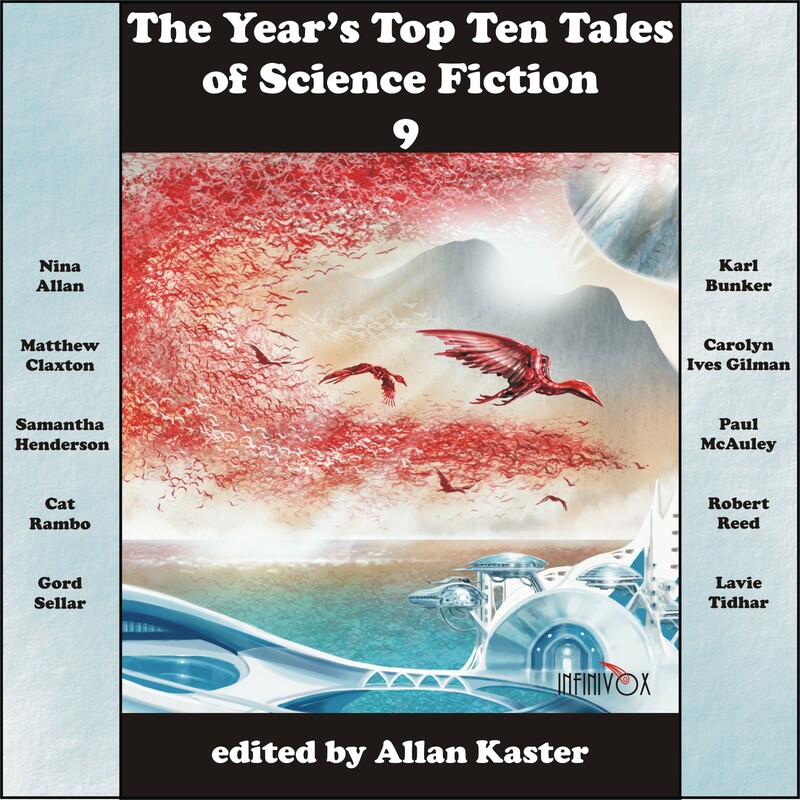 The Year's Top Ten Tales of Science Fiction 9 is also available as an e-book for $4.99 on the Kindle,click here , for iBooks through iTunes ,and click here for Nook. The trade paperback book is available here for only $15.99 . The audiobook can be downloaded from audible. The Year's Top Ten Tales of Science Fiction 9 is an unabridged collection spotlighting the “best of the best” science fiction stories published in 2016 by current and emerging masters of the genre, edited by Allan Kaster. In “The Art of Space Travel,” by Nina Allan, the staff of a hotel prepares for the crew of a one-way mission to Mars on the heels of earlier disasters. An artist and his wife search for fulfillment in a utopian world created by AIs in “They Have all One Breath” by Karl Bunker. In “Patience Lake,” by Matthew Claxton, an injured military cyborg helps defend a farm family that has helped him. In a top secret job, an all too conscious bus driver takes a non-cognizant alien and his human translator on a tour of the United States, in “Touring with the Alien” by Carolyn Ives Gilman. In “My Generations Shall Praise,” by Samantha Henderson, a woman on death row is persuaded to have her mind overwritten so that a wealthy relative can use her as a host body. People adapting to a melted Antarctica evolve new folklore, superstitions, and myths in “Elves of Antarctica” by Paul McAuley. In “Red in Tooth and Cog,” by Cat Rambo, a woman acquires a keen interest in the small domestic appliance AI ecosystem that evolves in a park after her phone is stolen. An ancient robot tells a human how it helped build the Great Ship, a planet-sized starship, from hyperfiber in “Parables of Infinity” by Robert Reed. In “Prodigal,” by Gord Sellar, an uplifted family dog questions the relationship between dogs and humans and then takes action. And finally, in a Bradburyesque tale, people go to Mars via cheap, one-person, one-way spacecrafts called jalopies in “Terminal” by Lavie Tidhar.